Yosi Samra is best known for their fold up flats that come in a wide array of colors and designs to fit everyday style, for everyday women. And I have these lovely compact flats because they are now available in Singapore exclusively on Just Tangy!! Discovering Yosi Samra ballet flats are a joy. I love so much about them. Check out the limited range of colours/design currently available. More will be coming soon! I got myself the Samara Charcoal Silver. I figure it’ll go well with almost anything! Yes, this is how much space a pair of Yosi Samra Ballet Flats takes up in my handbag. So small and so compact! This is perfect for days which calls for me to wear painful high heels! I love how easy they are to fold, making it super easy to be carried around in the small pouch that the flats comes with. The first time I slipped them on, I knew they were for keeps. 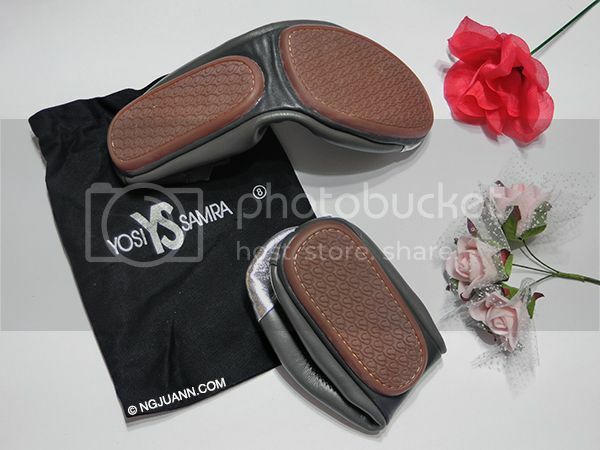 Foldable shoes tend to be flimsy but not my Yosi Samra! The stitching and soles were pretty tough and very well made. Oh did I mention that the shoes are 100% made from leather? The soles are bouncy and provides good cushioning for your feet. Yosi Samra is the New York Designer is the creator behind the foldable flat revolution. The essence of classic, his products are a must-have fashion staple for every woman! Designer Yosi Samra’s flats are fashionable, comfortable with mix patterns with colors to create unique, eye-catching designs. More about Yosi Samra here. JUST TANGY is a curated online store founded by Sarah Tang, who is an avid online shopper and a fan of exclusive international designer brands.She finds magic in bringing emerging international brands, which are highly sort after but unavailable locally, making them more exclusive and special to own. These brands are carefully selected for their exclusiveness, unique design and popularity. More about JUST TANGY here. Flat Out of Heels rollable flats are stylish, comfortable, durable …. Such a nice post sharing with us.